I am an active woman, and I'm not embarrassed to admit that I actually sweat. I had allergies to most deodorants from the time I first started wearing them, so I've tested countless natural versions in my search for the "perfect" one. 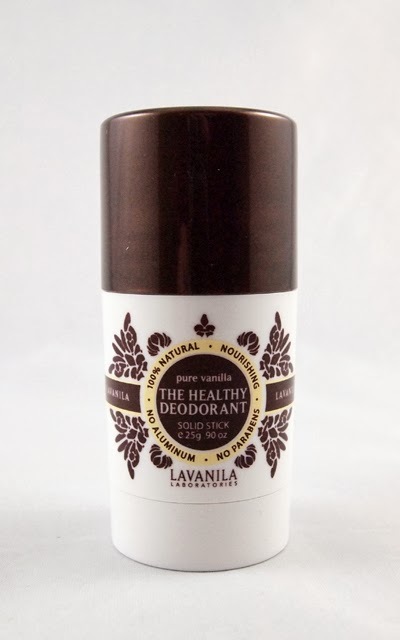 Results have varied, but when I hear of a natural deodorant I haven't tried, I like to give them a chance. The latest in my deodorant trials? 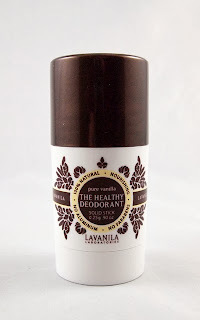 LaVanila's The Healthy Deodorant, in the Pure Vanilla scent. I loved the idea of a vanilla deodorant. However, the scent of this product was much more like baby powder with a hint of vanilla, which wasn't my cup of tea. I didn't have the chance to test out the other scents, so perhaps they would be more appealing to me. I was surprised to see this come up rating a 4 on EWG's Skin Deep database, but it seems the ingredient "botanical fragrance blend" is of unclear origins so the rating is heavily weighed down by it. Fortunately, the other ingredients are very gentle, and it is possible that the fragrance is non-synthetic. As far as performance, I found this stick to have some effect, but it wasn't strong enough for me. I tend to need strong deodorants (I've worn mens' deodorants regularly), so perhaps this would be enough for many women. I think it's great that this product is clearly labeled as vegan on the website and has such fun packaging. It is great to see a natural company who takes style seriously. While this deodorant is more expensive than others, it is sold at stores like Sephora, which has more "luxury" products. If you're looking for a stylish deodorant and don't sweat a lot, this line may be worth checking out. Disclosure notice: This product was purchased by the reviewer. No additional compensation was accepted for this review and the opinions are my own. Please verify any claims with the manufacturer, especially if you have any allergies or concerns.